We just changed the display on our seasons table and put the Halloween decorations up. 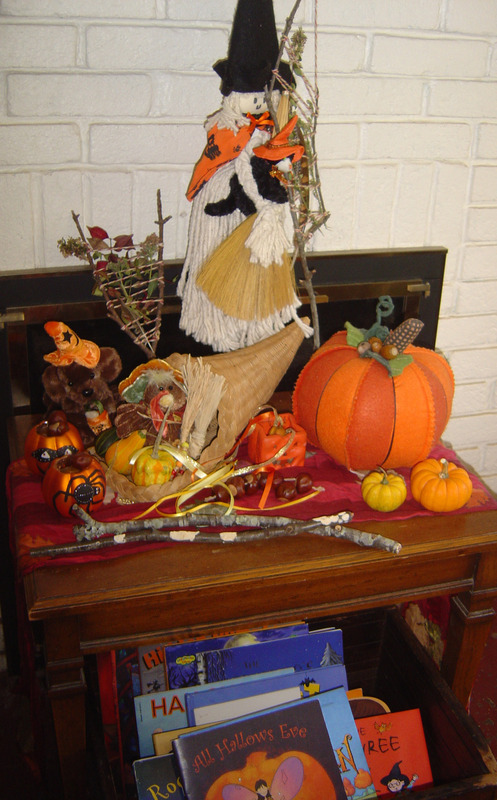 The table currently combines the signs of harvest and the turning leaves (cornucopia, gourds, Indian corn, acorns, chestnuts/buckeyes) with the fun of Halloween (witches, ghosts, trick or treating stuffed animals). But the highlight -– or at least the items our kids play with the most -– tends to be the box of seasonal books that we put under the table. The books that make the cut for the seasons box are the best-loved books for each season, titles that even our too-cool-for-school eldest daughter will curl up for hours reading – even though she’s way too old for the Berenstain Bears or Clifford . If these titles were taking up space on the shelves all year, I’d be sick of the sight of them and coveting the space for something else. When they only come up from the basement for a month or so, it’s a big occasion for our kids, and the shared reading of them adds to the sense of ritual and tradition of each season. It’s also something of a test kitchen in terms of the quality of the books, as only the favorite books get kept year upon year. And here I’m using quality to mean that elusive quality that keeps kids rereading and enjoying the book over time, not the more-easily identified and debated qualities that determine whether a book wins awards or not. So here (in no particular order) are a few of the Halloween/fall/autumn-themed books that my children have chosen to read or have read to them year after year after year. 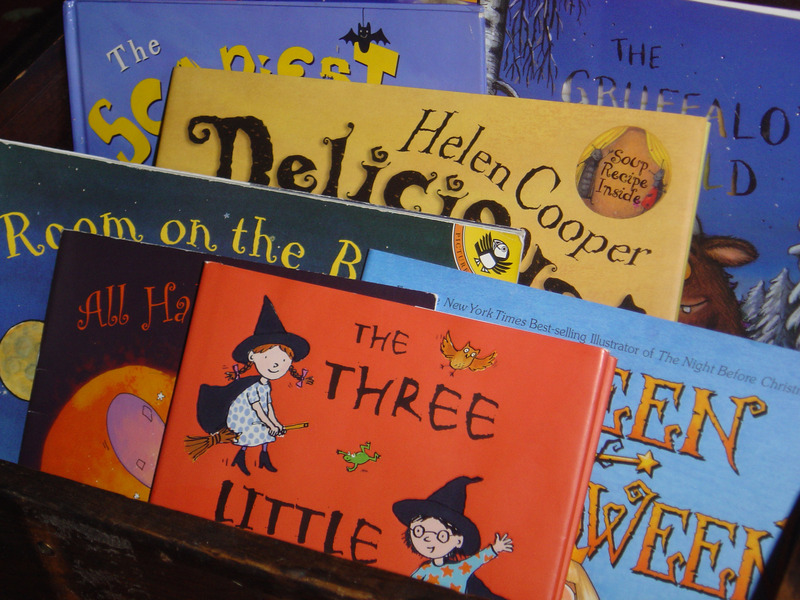 Fabulous artwork and a simple story about teamwork make all the “Pumpkin Soup” books by Helen Cooper essential picture books for this time of year. The clever and detailed art has kept our children interested as they’ve grown up, finding new things each year when they pour over the pictures. The fall title in Lynn Plourde’s quartet of season books. This story about the changing of the seasons, the end of summer’s heat, the falling of the leaves and the growing chill of autumn is a perennial favorite. It’s somewhat amazing that the publisher has allowed most of the books in this series to go quietly out of print. 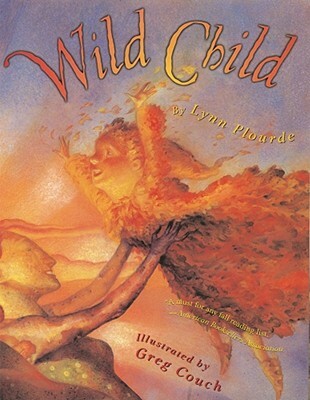 Wild Child appears to be the only one still available in paperback. Every so often we gift a set of these books to somebody or other, and have to get them directly from Apple Valley Books, who carry the remainder of the author’s copies. Hopefully, the publisher can return them to print or publish a single collected volume at some point. Yes, yes, I know it’s not cool to express a liking for anything that has become a cartoon series – a sin in hip bookselling circles comparable to expressing an enjoyment of anything published by Disney (which I’ll commit below) — but my girls loved the Angelina Ballerina series, and Angelina’s Halloween is one of the best. The pictures are expressive, detailed and quite lovely, and the story about a big sister who gets tired of her little sister tagging along is something that has had great resonance in our household over the years. My girls never get tired of the “seek and find” type of books. I couldn’t tell you what the overt storyline of this book is, except that everything rhymes. The story isn’t important in any case; the fun of this book is in pouring over the detailed pictures to find all the hidden – and expressive — pumpkins. A very simple early reader, the fun of this book is in the memories of our girls reading it when they were younger and hadn’t yet mastered their letters. Our first child couldn’t say the letter ‘S’ for the longest time, so this will forever be known as “Turtle and Nake’s Pooky Halloween” in our house. Here’s the dreaded Disney title… Our kids were big Winnie the Pooh fans at an early age, and yes we were known to pop a video on in order to get twenty minutes peace. Winnie the Pooh’s Book of Boo came along at just the right time. The video is long gone, but the girls still seem to retain a quiet (and surreptitious) enjoyment of the book. Why isn’t Julia Donaldson as huge in the US as she is in the UK, where 3-4 of her books always seem to be in Amazon’s top 100? Room on the Broom is a charming picture book about a witch and her menagerie (a cat, a dog and a frog) and their misadventure with a dragon who likes to eat witches. The simple, colorful pictures (by Axel Scheffler) are very expressive and not scary at all, the story is told in rhymes that appeal to kids of all ages. There’s enough humorous detail in the picture to reward rereading and encourage kids to pour over the artwork on their own. This is another book that takes a pretty elementary story (three school-age witches who live together and are planning a Halloween party), adds in lots of simple but detail-laden artwork and uses simple words with lots of repetition. The story is too long to be read in a single sitting, so it makes a good book to read over a couple of nights at Halloween, and the language makes this a perfect introductory “chapter” book for kids graduating from early readers. Even my older daughter likes to re-examine the pictures and listen as I read this to her younger sister. As a child’s reading ability grows, they can begin to read this to themselves and will not be intimidated as they can be by more text-heavy early chapter books, nor will they be able to memorize this as with many favorite picture books. This is the story about Eve, the Halloween fairy, who takes your extra candy and leaves toys instead. It’s a clever and well-spun story that will (happily) have your kids wanting to leave most of their candy for the Halloween fairy. A possible addition to the Halloween box his year may be On a Windy Night by Nancy Raines Day and George Bates. It’s a slightly scary tale of a boy making his way back through the woods after trick or treating. He’s alone – our youngest immediately made me promise she’d never have to trick or treat alone – and his imagination runs away with him as he imagines every rustling leaf to be a monster and every bare tree to be a skeleton. The art work is clever, full of suggestive shadows and atmospheric embellishments. The clouds take on monstrous shapes, the bare tree branches seem to reach out toward the boy and the moonlight makes a cornfield appear to come of life. Whether the book was too suggestive and scary for my youngest remains to be seen, but she did appear to greatly enjoy the story and art on first read. It’s quite cute to see our oldest, who has recently been devouring The Penderwicks and Kate Di Camillo’s oeuvre on her own, reading through a stack of old favorite picture books, or reading them to her sister. It remind us how far we’ve come as a family, how much our girls have grown, and keeps us hunting for the next fun reading experience.